Easter basket ideas come in all shapes and sizes. However, the best ideas somehow appeal to the one who will be receiving the basket, which in most cases is a small child. When designing an Easter basket for or with a child, it's important that the basket is cute, colorful, and functional (meaning it will hold tons of gifts and candy). We've gathered some of the most creative and do-able Easter basket ideas that we know you'll love as much as we do. What fun would Easter be without a little whimsy? In fact, we think it's perfectly practical for some chickadees to take a make-believe hot air balloon ride around the house in search of some Easter eggs. This Easter basket idea is a fun one to make with a child that is in either preschool or kindergarten. Although the basket might not turn out as much like a white picket fence as the one in the photo, you'll have a ton of fun making it. If you have a lot of Easter baskets to make, this project is ideal. If you're brave enough, invite all of the neighborhood kids over for an Easter egg hunt. Before the hunt begins, have the children fold up their own basket using these printables. If your child is in grade school and has a thing for glitz and glitter, this unicorn basket transformation might be perfect for Easter. In fact, purchase some stickers and glue-on accessories that a pre-teen would like and let them decorate their own. This Easter basket idea is perfect for crafters that have a ton of extra fabric around their craft room. Don't be afraid of unusual color combinations for a more eclectic look. Felt is an ideal material for Easter crafts. To make this simple basket, opt for a thicker wool felt that is at least 5mm thick. Keep the bottom threading thinner and match it to the main felt. Then pick a thicker accent thread for the top detailing. This simple fabric skirt is a less extreme version of the tutu Easter basket tutorials. Pick 2 to 3 fun fabrics to recreate this look. The best part about this tutorial is that it is a no-sew project. All you need is your fabric and a hot glue gun. This cute chickadee crochet basket is usable for Easter time but would also make a charming organizer in a small child's bedroom all year round. Also, this pattern can be modified to create a sheep or a bunny. If you have an unloved stuffed animal, consider turning it into a cuddly Easter basket by cutting a hole in the center and adding a liner. To make this project truly fit in with the occasion, consider using a bunny, chickadee, or duck. For slightly older children, this Easter basket idea will be a welcomed change from overly kiddish baskets. 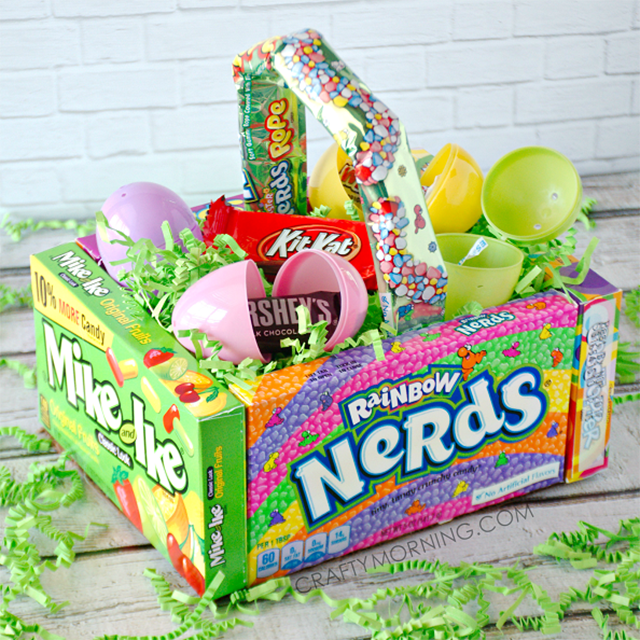 Turn all their treats into a basket of their own using larger boxed candies and a hot glue gun. Need a cute gift idea for a little girl? Sew this bunny purse and use it as an Easter basket for little cost. We especially love the floppy bunny ears and winking eyes. This Easter basket may not last all year round, but it will make quite the impact on Easter morning. Instead of hiding this basket for your children to find, consider using it as a centerpiece on your Easter table instead. If you already have Easter baskets, consider upgrading them by adding these elegant gift tags. The best part is you're able to customize the printable with names before printing them off. This particular Easter basket idea is very popular on Pinterest. Though it seems like it would be hard to replicate, a little patience and attention to detail will go a long way on this one. Consider picking a theme or color for best results. This minion idea is only one example of how you can transform the string egg Easter basket idea into a particular theme. The are dozens of options, but make sure you pick one that will really resonate with a child because perfecting this type of basket will take time. If you're having a hard time figuring out how to make a fun Easter basket for the boy or man in your life, take a simple basket and add a fun liner. This tutorial will show you how to either sew or hot glue the basket liner, so it's perfect for any skill level. Woodworkers will enjoy this cute Easter basket idea because not only is it easy to make (with the right tools), it will function as a tool box for your child for the rest of the year. Recycling projects like this one utilizing a gallon of milk are perfect to take on with your young children. Once you cut out the center hole, let your child decorate to their heart's desire. It may not be the most beautiful Easter basket, but it will be a really fun one. These sweet Easter baskets remind us of something fit for a princess. They are delicate and can be as glitzy and filled with flowers as you want them to be. Even if you don't use these smaller baskets for the main Easter egg hunt (because they are fragile), they will look great in photos of your child dressed in their Easter best. If you completely forgot when Easter is this year and need a quick idea, consider utilizing something you already have, like a pair of your child's rain boots. Honestly, almost anything that can be filled with candy (or non-sugar gifts) will be fun for a child to dig through. This is another fabric Easter basket pattern we love because it's relatively easy to make and should last for many Easters with the proper care. These next few ideas might seem extremely simple but they will be of great use when lacking time and resources! For this project, take any old basket and add three pastel ribbons in varying colors and widths. Here is another crochet pattern for an Easter basket. Unlike the chickadee from earlier, this basket has several floral decals and even has some crocheted Easter eggs. Make these baskets as gifts and put them on display with other Easter decor in your home. While construction paper might not seem durable, it is actually solid enough to hold small candies and Easter eggs. Help your child work on their motor skills by having them cut out specific shapes you need for these baskets (so long as they are old enough to be using scissors safely).